George Boole was an English mathematician, educator, philosopher and logician. He worked in the fields of differential equations and algebraic logic, and is best known as the author of The Laws of Thought which contains Boolean algebra. Boole was born November 2, 1815 in Lincolnshire, England. His father, John Boole (1779–1848), was a tradesman in Lincoln. At age 16 Boole became the breadwinner for his parents and three younger siblings, taking up a junior teaching position in Doncaster at Hingham’s School. Boole`s status as mathematician was recognised by his appointment in 1849 as the first professor of mathematics at Queen`s College, Cork (now University College Cork (UCC)) in Ireland. The first time Boole met his future wife was in Cork in 1850, when Mary Everest came to visit her uncle, John Ryall, a friend of Boole’s and Vice-President and Professor of Greek at Queen’s College Cork. She was only 18 at that time while Boole was 35. In 1852 Boole visited Mary’s family at Wickwar, a small village in south Gloucestershire where he gave Mary informal lessons in mathematics, a subject in which she SHARED a deep interest. In 1855 Mary’s father Thomas Everest suddenly died.On 11 September 1855 they were quietly married in the Church of England Parish Church of Wickwar. The Boole’s had five daughters including Alicia, a mathematician, Lucy, a professor of chemistry, and Ethel (Voynich), a novelist and author of The Gadfly. Boole was deeply interested in the idea of expressing the workings of the human mind in symbolic form, and his two books on this subject, The Mathematical Analysis of Logic (1847) and An Investigation of the Laws of Thought (1854) form. He also made important contributions to areas of mathematics such as invariant theory differential and difference equations and probability. In 1864, Boole walked two miles in the drenching rain. He soon became ill, developing a severe cold and high fever. 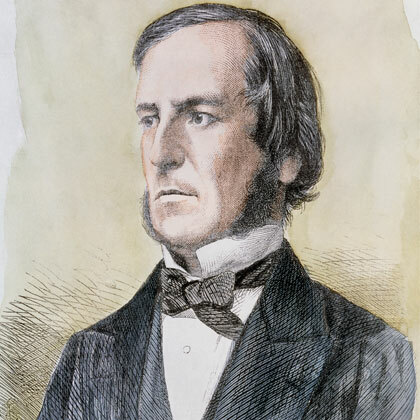 Boole`s condition worsened and on 8 December 1864, he died of fever-induced pleural effusion.